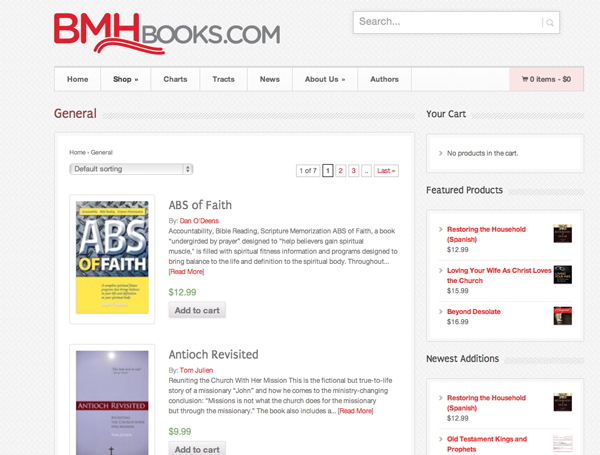 A redesigned website for bmhbooks.com, the Internet presence for BMH Books, has been launched. 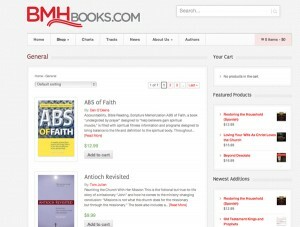 Featuring a new logo and a crisp look, the site includes easy-to-use search features, an shopping cart, and information about the more than 140 products in the BMH Books catalog. Many of the books are useful for small group or Adult Bible Fellowship studies or to augment personal study of the scriptures. BMH Books, the publishing arm of GraceConnect (the Brethren Missionary Herald Company), has been producing quality resources on the topics of theology and Christian living for more than 70 years. While many of the books are also available through amazon.com and cbd.com, the only website where individuals may purchase the Life’s Most Important Tract is at bmhbooks.com. In addition, Bible study charts by developed by Dr. John Whitcomb, popular conference speaker and former faculty member at Grace Theological Seminary, are only available at bmhbooks.com. Individuals interested in purchasing ebooks may click through the site to download a copy to their electronic reader. Currently, five titles are available in the ebook format on Kindle, Nook, or iTunes. These include: The Three Princes, by Tom Julien; God of Hope by J. Davis Illingworth; Released, by Tom Roy; Chasing After Faith, by Mark E. Lingenfelter; and Beyond Desolate, by Tammy Schultz and Hannah Estabrook. Plans are in the works to release additional titles in the ebook format.